It's time to rethink the return on investment for cleaner technologies. Passenger electric cars get all the press, especially when someone launches one into space. But something important is going on in the world of commercial vehicles as well. Last year Tesla announced it would produce an electric long-haul big rig. PepsiCo, Walmart and UPS promptly committed to buying a few hundred. More recently, UPS made an important announcement about its plans to roll out 50 new midsize electric delivery trucks in Atlanta, Dallas and Los Angeles. The headline is that, for the first time, the electric trucks are expected to cost the company no more than regular diesel vehicles. Up-front price is no longer a barrier. But there’s a second part of the story that’s not being touted enough. These new trucks will create significant additional value for the business in ongoing operational savings, improved routing efficiency and brand building. In short, the electric vehicles (EVs) are much better than just a break-even proposition. Before explaining how this will play out, some context. These aren’t the first “alternative” vehicles in the delivery space. FedEx got there early in the U.S. in 2010 and has a couple thousand hybrids or EVs on the road now. DHL is putting 150 Ford-made EV trucks into service as well. And at UPS, about 9,000 of its roughly 112,000 vehicles already have some environmental advantage (most are powered by natural gas, but 1,000 are electric hybrids or pure electric). But until now, companies have spent more up front in order to test EVs out. Electric trucks were generally considered unworkable, both economically and in terms of the power needed to haul big loads. Broadly, the cost of electric batteries has plummeted 80 percent in just six years, due to innovation and enormous investments in production capacity, largely in China. And new composite materials are allowing for lighter vehicles, which extend the range of batteries. In the case of these new trucks, UPS worked closely with a supplier, Workhorse, to redesign the trucks “from the ground up,” says Scott Phillippi, UPS’s senior director of maintenance and engineering. Phillippi believes that the new design will reduce the truck’s weight by approximately 1,000 pounds, compared with a diesel or gas-powered vehicle. That plus better batteries will give the truck an electric range of around 100 miles, enough for most routes in and around cities. To show how serious UPS is about EVs, it also announced an interesting investment in EV infrastructure (in London) to allow more vehicles to recharge simultaneously. The return on investment is even better than it appears. These new EVs will cost less to run, use better technology to increase efficiency and build intangible brand value for the company. (1) Total cost of ownership will be lower. The EVs will use much less energy. Comparing “fuel efficiency” of diesel trucks to a vehicle that uses no fuel is difficult, but the EV will get the equivalent of around 52 miles per gallon (about five times the MPG of the gas truck). And, yes, an EV running off an electric grid with fossil fuels is still cleaner, no matter where in the U.S. you plug in. The maintenance costs will also be lower, since EVs have fewer parts and fluids. Phillippi expects total operating costs to be roughly 20 percent lower. Over a working life of 20 to 25 years, these savings will add up. (2) Higher-tech vehicles will operate more efficiently. An electric motor has “tremendous torque,” as Phillippi describes it, so “going zero to 30 in less time creates more efficiency in delivery.” Adding digital controls to the electric propulsion – a kind of Internet-of-Things technology play – will yield more precision in driving. Additional data will also help enhance the company’s long-standing efforts to squeeze miles out through smart routing. UPS, he says, has saved $400 million in recent years from its routing system. (3) There are brand benefits to this kind of innovation. 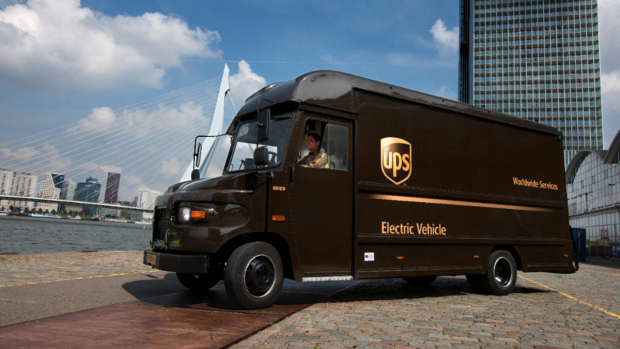 Electric vehicles from UPS (and other fleets) will sail quietly through streets while emitting no pollution. Also, cool new technologies used in the service of sustainability engage and excite employees. “Millennials want to know that they’re working for a company with a greater purpose,” Abney said. In total, on every dimension, the EVs are a better deal. And yet I’ll bet some companies, when deciding whether to invest in commercial EVs or other clean technologies, are waiting until the price is even with that of the traditional choices. I’d argue that this is a mistake. Let’s imagine you’re looking at an investment in a cleaner technology that costs 10 percent more in up-front cash. What if it has lower lifetime cost of ownership and helps the company innovate and build brand value? Wouldn’t the additional outlay up front be worth it? It’s also worth rethinking the ROI calculation for any clean techs that seem expensive now. If you wait for the simple cash return tipping point, you may be leaving money on the table, sacrificing profit and value. No doubt, the acceleration to EVs and other clean technologies is worth celebrating. But if companies got a little more creative about how they make their investment decisions, this important shift to sustainable technologies would be moving even faster. This article originally appeared on the Harvard Business Review and was republished with permission.